Broom, W. H. (William Henry), publisher. 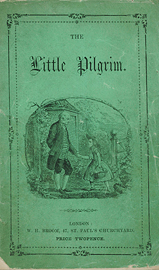 First sentence: "In a large old house, with two kind aunts, The little Marian dwelt; And a happy child she was, I ween, for though at times she felt." Publication date range found in P.A.H. Brown, London publishers and printers, p. 26. Copy in McGill Library Rare Books and Special Collections: green wrappers. Conduct of life -- Juvenile fiction -- Juvenile fiction.